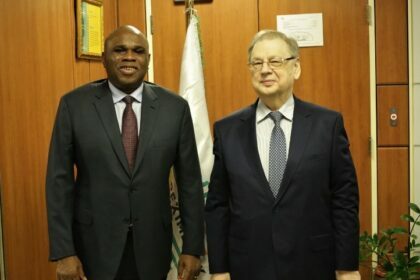 Cairo, 14 Feb. 2019:- Afreximbank President Prof. Benedict Oramah yesterday in Cairo received Serge Kirpichenko, the Ambassador of the Russian Federation to Egypt, who visited the Bank’s headquarters on a courtesy call. Amb. Kirpichenko told the President that he was at the Bank to deliver some messages from Moscow and to discuss ways of strengthening the relationship between the Bank and the Russian Federation, including support for the 2019 Afreximbank Annual Meetings which will be held in Moscow in June. He gave assurance that the Russian Embassy in Cairo would continue to provide any necessary support required by the Bank to enhance its activities, particularly with regard to issuance of visas and transmission of messages to Moscow. Earlier, President Oramah welcomed the ambassador and expressed the Bank’s appreciation to the Government of the Russian Federation for offering to host the Bank’s 2019 Annual Meetings. He briefed him on the preparations being made by the Bank towards the organisation of the Annual Meetings and welcomed the support of the Embassy in that regard. 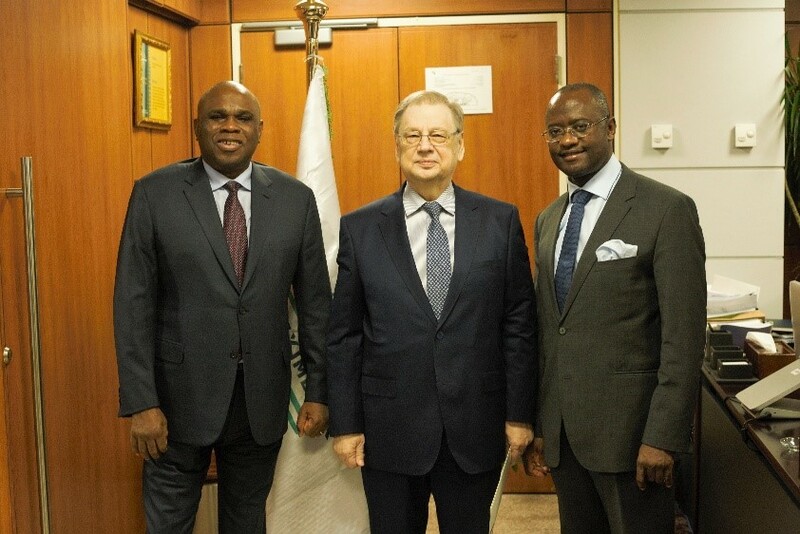 Afreximbank President Prof. Benedict Oramah (left) with Serge Kirpichenko, Russian Ambassador to Egypt (centre) and Dr. George Elombi, Executive Vice President, Governance, Corporate and Legal Services, Afreximbank, during the visit.